[caption id="attachment_4105" align="alignright" width="150"] Gate Valve Lockout[/caption] Valve Lockout Devices are used to close off many kinds of pressured valves to ensure that the machinery that is valve operated remains switched off while workers carry out the maintenance work. 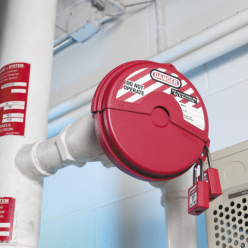 The Valve Lockout Device is attached over the operational part of the valve, before securing it in place with padlocks or hasps. There are many types of valve lockout devices with the main ones being: Gate Valve Lockout Device – these lockout devices completely cover the valve thereby preventing access to the valve. They consist of 2 half moons, hinged at one side. They are placed over the valve, closed and then locked off using padlocks or hasps where more padlocks are required. [caption id="attachment_4177" align="alignleft" width="150"] Ball Valve Lockout[/caption] Ball Valve Lockout Device - these lockout devices clamp over the valve lever, thereby preventing the valve from being moved. Butterfly Lockout Device - these lockout devices are similar to Ball Valve lockout devices. However instead of the devices clamping over the valve lever, the wedge on the slider section fits between the compression handle and lever, thereby preventing the compression handle being squeezed to operate the valve.